Integrated Support Service Coordinator, Office of Student Affairs, Faculty of Medicine, University of São Paulo, Brazil. 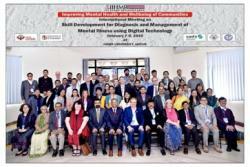 I had the opportunity to participate this week at the international event on Improving Mental Health and Wellbeing of Communities: Skill Development for Diagnosis and Management of Mental Illness using Digital Technology, held in Jaipur, India, and organized by the World Psychiatric Association, University of Chester, South Asia Self Harm Initiative, Indian Council of Medical Research and Indian Institute of Health Management Research (IIHMR University). The first positive impact was perceived in almost every human sense, at our reception by the Indian university of health management research. The exquisite care in our reception, from the decoration of flower petals on the floor and columns, to the placement of signs marking our position in the auditorium to promote exchange of experiences among the members of different participating countries, reveals the disposition of the Indian organizing team to provide a memorable moment for the development of research that favours the improvement of mental health care standards in vulnerable populations. The South Asia Self Harm Initiative (SASHI) is a joint lead of British, Indian and Pakistani universities for collaboration in the development of research on mental health and self-harm in South Asian populations. This initiative explores the critical points related to the particularities of culture and society in the different participating countries. It is certainly not an easy task to overcome the barriers of cultural and social particularities in the production of solid academic and scientific knowledge, backed by good research. Perhaps this is the greatest asset of this initiative, largely achieved by mutual collaboration between researchers from the UK, India, and Pakistan. It was a remarkable and special opportunity to have been able to attend to this conference and workflow meetings as a South American listener, member of the University of São Paulo, Brazil, having an academic background of one of the main universities in Latin America in terms of health research, and being able to contribute my points of view to the issues brought during the activities. The participation in meetings for the discussion of research protocols allowed me to testify the continuous effort in the search for excellence in data collection and analytical work by the SASHI researchers, and brought me knowledge about the management of collaborative research that I intend to bring to South American reality. Lots of opportunities for networking: Sudeep, P.K., Sathish,, G., Steven Jones and Arthur Danila. The prospect of possible collaboration with the current project with a focus on the undergraduate student population, and the possible expansion of research protocols to approach South American context is something fascinating! I sincerely thank all the SASHI members for the special opportunity to participate in this enthusiastic initiative as a listener, being sure to witness the serious commitment to the scientific quality in the production of research with a practical focus on the translation of academic knowledge, as a tool to build a solid social transformation in emerging countries.